Some that have made it this far. For me, spring and fall bring the need for longer stretches of work in the garden, turning soil, adding compost, pulling out the old, and planting the new. In between, given enough water and properly mulched, the garden seems to take care of itself. Today, I had a few uninterrupted hours to work, and seized the moment to plant some of the beds for summer harvest. I have one bed that is a square foot garden and decided to plant it entirely with bush beans for drying. I think dried beans are one of the most beautiful foods and grow them almost entirely for that reason. If I had more space, I would grow several varieties. Today I planted Calypso, a black and white beauty. I pulled up a section of the strawberry patch, and in its place sowed a row of carrots and two “hills” of Dakota Desert, a sweet and creamy winter squash. I tended to the seedlings. 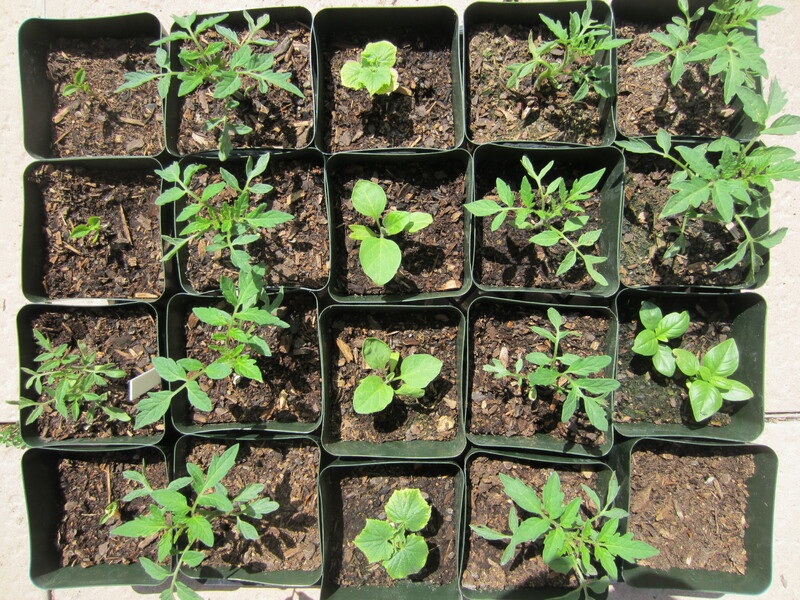 This morning I was reading Margaret Roach’s blog, A Way to Garden, and learned that you get stronger tomato seedlings if you rustle the plants for a little while every day. The movement creates strong stems. So, there I stood, petting my tomato seedlings. And, this is just to the beginning. For me, spring is such a hopeful time. I sow the seeds and imagine my bountiful (pest free, disease free) garden. I get anxious, wanting the winter crops to finish up, so I can pull them up and put in the new. But I don’t, because the swiss chard and shell peas are so tasty, and the garlic has a few more months until it is ready! Love it Jess! I picture you petting your tomato plants and it makes me smile. I do the same thing with mine. Thanks Jen! The thought of it myself makes me giggle. Hooray for blogging! Hooray for starting from seed! I’m growing lots of dry beans this year as well. We should trade our winners this fall. And, I’m so glad you’re enjoying Uncle David’s Dakota Dessert. It is such a winner. I’m trying some new squash this fall; I have high hopes. If they’re great, I’ll share. Hi Christina! Yes, I would love to trade beans. I think I am going to plant a couple more varieties. I am also planting a couple new winter squashes. In the past, I have had trouble getting the fruit to set, so I think I am going to try to hand pollinate. Maybe that will give me more success.